N.C. State's all-time great basketball star, David Thompson, said it was for “losers”. The 11-time N.C.A.A. champion U.C.L.A. Bruins refused to hang its championship banner from the rafters of Pauley Pavilion. The N.I.T. (or National Invitation Tournament) is the me-too event of the sports world. It's a college basketball tournament that has even less relevance than a cameo by Twiggy (should I insert Kate Moss instead?) on 'The Biggest Loser'. To those of you not in the know, the N.I.T. pits those highly mediocre college teams that were excluded from the Big Dance (AKA March Madness; AKA the N.C.A.A. Division I College Basketball Championship, etc.). Lots of top schools have refused to participate in the past, including: Oklahoma State, Louisville, Georgia Tech and Georgetown. So, why does the N.I.T. still exist? Their website points to a rich heritage and unique format in which teams get to play on their home courts before four finalists compete for the title at Madison Square Garden. Oh. I think the real reason the N.I.T. still has a pulse is purely economic. The schools need the revenue. So, too, does the N.C.A.A., which in an ironic twist, bought the ailing N.I.T. a few years back. But, no one, and I mean no one, else cares about the second-rate tourney. My alma mater, Northeastern University, is playing in this year's N.I.T., but you won't see me trash-talking about it. I'd rather forget it altogether. In a 24×7 sports world already chock full of leagues, all-star games and tournaments, someone should step up, do the right thing and euthanize the N.I.T. It would be the humane thing to do. It seems like the NCAA just can’t stay out of trouble these days. Last week we found out that NCAA investigators were probably guilty of obstruction of justice. Then this week a judge ruled that a class action lawsuit against the NCAA by Ed O’Bannon can proceed. The O’Bannon lawsuit is pretty convoluted, but it could help further erode the NCAA’s power. The problem is that could take a while. Here to help explain it is my friend, the made-up non-lawyer questioner, for yet another legal Q&A. Q: So what is Ed O’Bannon suing for? A: When you play an NCAA sport, you have to sign a waiver that relinquishes your right to make money off your likeness as an NCAA athlete. The NCAA let EA Sports use those players’ likenesses in video games, like the NCAA Football and NCAA March Madness series. The NCAA probably could have gotten away with this if they only used current players in these games, as college athletes don’t usually have the inclination to sue people who could suspend them and don’t have the money to pay for litigators. But EA and the NCAA got greedy. They used classic teams, like the 1996 UCLA Bruins basketball team. This caught the attention of former UCLA power forward Ed O’Bannon, who’s now a car salesman outside Las Vegas. He doesn’t work in sports anymore, so what does he have to lose by suing the NCAA for using his likeness? He later got Tyrone Prothro, the Alabama receiever whose leg injuries in college prevented him from having a pro career, Bill Russell, Oscar Robertson and others to join his suit. Q: But they signed those waivers giving up their right to use their own likenesses. A: This is where the Sherman Antitrust Act comes in. Today you can’t get a bill preventing rich guys from doing bad stuff passed, because a majority of the House of Representatives thinks Atlas Shrugged is nonfiction. But a century ago you could! The Sherman Antitrust Act specifically bans artificially fixing prices, aiming to mean people and businesses are paid what they deserve. O’Bannon is alleging that if the NCAA didn’t force him to sign this contract, then he could have gotten money from someone else (say, an EA competitor) to use his likeness. Thus, it essentially fixed the price of using his image at zero. Even if you consider players’ scholarships adequate payment for their services, this still artificially depresses how much they’re paid. If a judge agrees, the waiver would be considered an illegal restraint of trade under the act. Q: So is O’Bannon just suing on behalf of himself? It’s all about MONEY Repman. All of the sports leagues have diluted their products. They’ve added more teams to the post-season tournament(s) and, in some cases, have added preseason tourneys to extend the season. Games get televised which draws revenues from the networks. I remember the NIT back in the late sixties when I first started as a sportswriter. Jay Horwitz, now the PR man for the New York Mets, had been the sports information director at New York University and got me courtside tickets and there were some great games back in those days with Donnie May of Dayton in 1968, Dean Meminger of Marquette in 1970, John Shumate of Notre Dame in 1973 and Cedric “Cornbread” Maxwell of NC-Charlotte in 1976. But as the NCAA Tournament began to expand its field, the lustre of the NIT began to wear off. Back in the early days, the field was 16 or 24 teams. Later it expanded to 32 and eventually up to as many as 40 before it reverted to a 32-team field about five or six years ago. It’s nice for recruiting purposes to tell a kid that we went to a post-season tournament and traveled to New York City. But look at the professional leagues, too. The National Football League expanded its playoffs to include two wild cards. How many teams make the post-season in the NBA and the NHL? And even Major League Baseball has implemented wild card teams. But what’s the purpose of playing a regular season. Let’s face it, in college basketball, teams can play each other as much as four times — twice in the regular season, conference tournament and then the post-season tournament. Suppose Team A won the first three meetings. How do they possibly get motivated for a fourth go-round? The NIT plays its early round games on the home court of the higher seeded team until the semifinals and brings the four schools to New York for the semis and the championship game. While these games don’t conflict with the NCAA Tourney, they certainly are less attractive and the sparse attendance at these games are indicative of the quality of play. 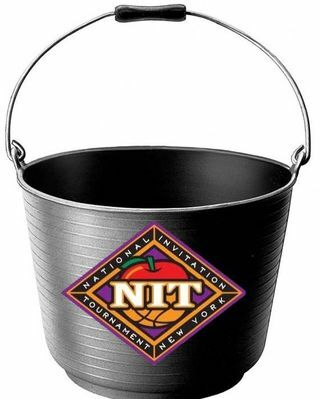 Can the winner of the NIT beat some of the teams that are in the NCAA Tournament? Absolutely. The “play in” games are a joke but, then again, it’s all about money. And the NCAA will take that to the bank. Point made, Tim. I think it’s also an opportunity for some truly obscure schools to gain notoriety, however limited it may be. My only defense of the N.I.T. (even though I could personally care less about it) is that it gives the student-athletes something else to play for. While the teams may not have had the best seasons, the athletes still put in a lot of time/effort throughout the season. This allows them to play for a chance to play at MSG, which in itself is a once-in-a-lifetime opportunity for most of these young kids. I bet if you asked most of the athletes, they are happy to continue playing the game they (hopefully) love.